The new edition of the "foodies' bible" the Good Food Guide has three South West restaurants in its top 50. Restaurant Nathan Outlaw in Fowey, Cornwall, moved up one place to 10th, with praise from the guide for offering "dazzling fun food from a wizard". Shaun Rankin's Bohemia restaurant in Jersey was again ranked at 17th, while Michael Caines' Gidleigh Park was placed at number 22. The guide is produced every year by the consumer charity Which?. 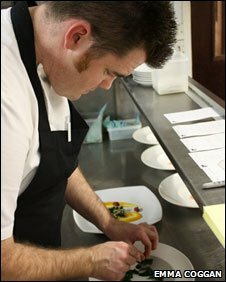 The Michelin-starred Restaurant Nathan Outlaw is in Fowey's Marina Villa Hotel. Hotel spokesman James Coggan said: "Obviously I'm very proud of Nathan and the team and, although it may sound blase, it's what we've come to expect. "I think the guide's 'wizard' reference is richly deserved because he always produces something fantastic out of basic ingredients." Mr Coggan said next year the chef intended to focus even more on fish caught locally and landed at Looe, including mackerel, whiting, coley and ling. "I suppose you could call them 'unfashionable', but the magic is that Nathan makes them taste as good as cod - better in fact," he added. Heston Blumenthal's Fat Duck in Bray, Berkshire, took top spot. It is the experimental television chef's third year at number one and, despite being forced to close in February following a norovirus outbreak, the restaurant was the only one to be given a score of 10 out of 10.